Word is there a significant fuel spill of bunker C fuel at Tufts Cove. Sources indicate a pipe burst at the power plant leaking bunker C oil. The Coastguard has Halifax Inshore rescue on scene. As well Connors Diving was deploying oil boom. UPDATE 21:00: ECRC D03 (Above) was on scene as part of the cleanup. the East Coast Response Co Maintains staff and equipment to deal with oil spills at oil production and shipping facilities, and maintain equipment at the Ultramar dock in Eastern Passage. Bunker C tends to float, and it looks like boom was deployed quickly, probably easing the cleanup in the Harbour. I would expect Transport Canada to have there red Dash-8 100 aircraft performing NASP Flights looking for additional pollution. Though the Tufts Cove plant normally runs natural gas, it was originally built as an oil fired plant to replace the coal fired plant in the south end (which has now been remade into Nova Scotia Power headquarters) the plant typically tops up the bunker C from a tanker every year. I’m getting reports of Oil on the water well south of the narrows. there also appears to be a helicopter performing an aerial survey in the area. Yesterday Evening a NotShip (Notice to Shipping) was issued requesting a Low Wake and Wide birth when passing tufts cove. 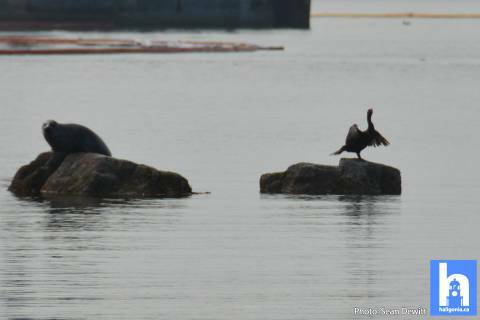 Photos via our friends at Haligonia (Via Twitter), from the shores of Shannon Park. Oil on shore where the tide went out, also Birds and Seals potentially effected. UPDATE 11:49: NSP’s promised update by 11:30 is now 19 minutes late. The leak was discovered in an exterior pipe that runs from the onsite storage tanks into the facility by staff during a routine inspection. Plant staff immediately activated environmental response protocols by stopping oil flow through the pipe to prevent further leakage, deploying a boom in the area of the water nearest to the leak, and alerting the company’s environmental services contractors. Work last night and this morning included the installation of two additional booms in Halifax Harbour in front of the plant as a precaution to contain the oil. Vacuum trucks and oil absorbent materials (pom poms) are being used to remove the oil from the water surface. Additionally, workers are actively assessing the water and shoreline in the area by helicopter and by boat to prioritize areas requiring cleanup. We still don’t know how much oil was released, or since this was apparently discovered by routine inspection – how long oil was leaking for. Update 08/07: Cleanup continued over the long weekend, and a large area infront of the power plant is still boomed off. 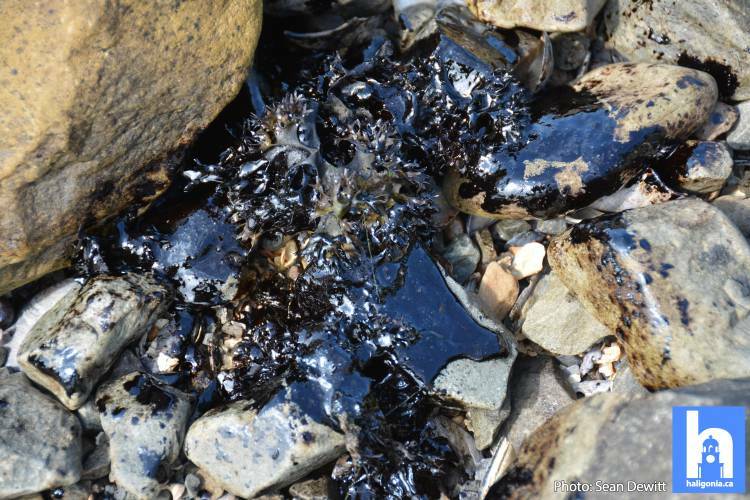 There are also reports of Oil on shore outside the boomed area – which is likely, as the outgoing tide would draw the oil south. 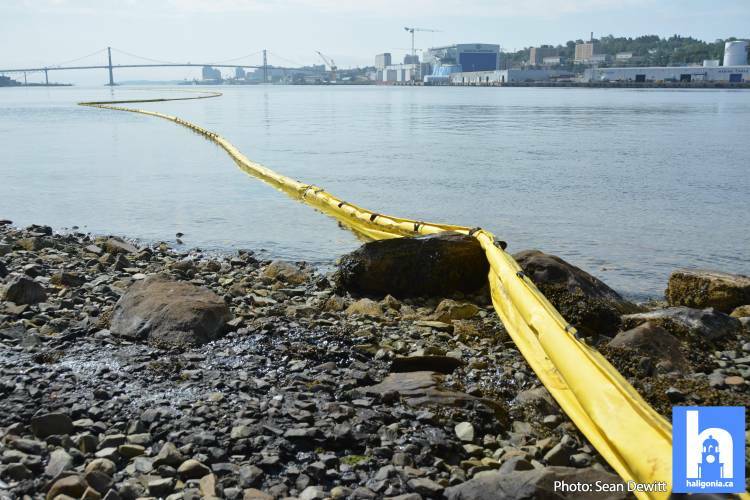 NSP reports the spill happened within 2 hours of discovery, which would have the spill occurring on the rising tide. NSP Claims the spill was 5000L – onto Land this sounds like its under reported, given the oil still in the water, and the reports of oil not contained within the booms. Nearly a week after a oil spill at the Tuft’s Cove NSP plant, booms and new signs warning of the spill remain in place. Sound makers to scare off wildlife also can be heard in the distance. This entry was posted in opps on August 2, 2018 by Peter.